LIFE IN SAUSALITO | Carol Sheldon writes books exploring times-past through mystery, love, betrayal and murder. It’s been a while, I know. I’ve been so busy and so excited writing my new novel MURDER IN SAUSALITO, that I’ve been negligent with this blog. Sorry. 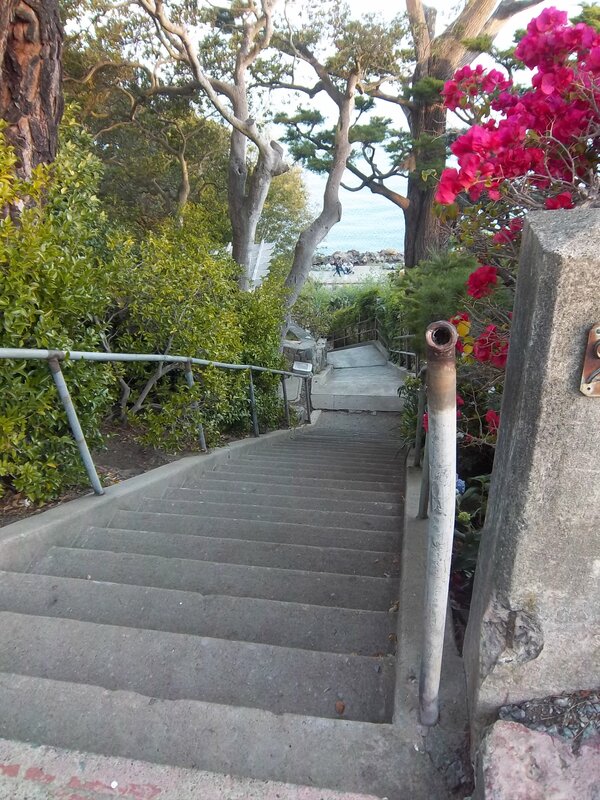 The photo you see is of one of the many stairways, many of them hidden, (of which I write in my new book). The town is at the bottom of this hill. Beyond that, can you see the Bay at the bottom? I can’t tell you how motivating researching and writing about my own community is. I take rides to places I’m writing about like the headlands, the town, the boat community, the hill community, and mountain out to Stinson Beach. Of course I take pictures of these things too. You’ll see many of them in the near future. The header page will change soon too. You Michigan fans, I hope you’ll stay with me! I know you’ll be green with envy while you mid-westerners are suffering below (way below, I hear) temperatures, we’re enjoying 60-70 degrees here. Unusually warm for us in northern California. Therefore, we can have lunch outdoors, go for walks, etc. Hey, I put in my time in cold weather, most of my life–Michigan. So there. If you don’t know, Sausalito is in Marin Country, just north of the Golden Gate Bridge and San Francisco. This entry was posted in Historical Fiction, mystery. Bookmark the permalink.